The questions we always mean to ask the vet but forget. Things we do the same every year, but wonder what the vet really thinks. Or the questions we're afraid to ask because we assume everyone knows. Here are a few of the common questions – and some unusual ones too – about calving, with answers straight from the mouths of vets. Dr. Gary Schieber is a large animal vet and co-owner of High Plains Veterinary Clinic in Sidney, Mont. A native of Newkirk, Okla., he graduated from vet school at Oklahoma State University. Dr. Cal Davison is a large animal vet and owner of Miles City Veterinary Services in Miles City, Mont. He is a native of Kremmling, Colo., and graduated from Colorado State University with his vet degree. 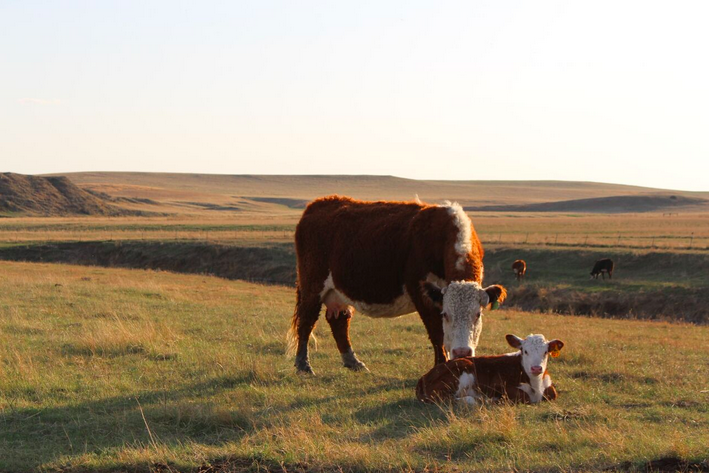 What calving situations do you deal with most as a vet? Dr. Schieber: With heifers what we mostly see are situations where the heifer is too small, or the calf is too big, and those require a cesarean. With cows most of what we see are malpositioned calves – they have a foot back or their head back, or they're breach. Sometimes ranchers can get these taken care of if they're fairly simple, but the difficult ones people bring in. Is there a correct way and an incorrect way to put calving chains on legs? Dr. Schieber: We do recommend to people, if the calf is in a normal presentation with its front legs out, that they can use an OB chain to pull on the front feet. The important thing is to wrap the chain above the fetlock and then do a half hitch above the dewclaws. This makes it less likely that you will break a leg if you're pulling too hard. If you just put the chain above the ankle and end up pulling hard, you can break the leg just from pulling. What is important to know about colostrum? Dr. Davison: A calf only has a 24-hour window to receive colostral immunoglobulins before the intestines are closed down to absorption of them. But, it's also important to know that anything that enters the calf's digestive system also triggers those intestines to start to close to antibody absorption. So if you give milk replacer to a calf that hasn't had colostrum yet, you start to reduce its ability to absorb the immunoglobulins from colostrum. A person wants to be careful that if a calf hasn't had colostrum, it gets it first. At what point should I get concerned if a heifer isn't making progress with calving? Dr. Schieber: We recommend that if a heifer has been calving actively for 45 minutes to an hour without progress, you probably need to at least bring her in and check her out. Check if you can see feet or a nose. If the front feet and the head are in the birth canal or near the birth canal, then proceed with trying to pull the calf. If you can't see what you should be seeing, then you should be concerned. If I live far from town, should I do anything different? Dr. Schieber: If you live farther from town, I would try and intervene a little sooner, make a decision quickly, and try not to mess around with doing too much yourself if you think there is a concern. If the heifer is in a difficult birthing situation, time starts to become your enemy. We see a fair amount of that – problem calving and c-sections that come from 70-80 miles away. I still recommend giving her 45 minutes to an hour to progress, but then if she hasn't, don't waste a lot of time deciding what to do. Do you ever recommend giving drenches, supplements or any medication to cows or calves after a difficult birth? Dr. Davison: This really is a case-by-case basis, and depends on the cow. We have some that we'll give Cal-Dex to, sometimes in an IV if it looks like we're in a hypocalcemic situation. We'll have some that we'll give an oral drench product that has amino acids, energy, electrolytes in it, if it's a cow that's been down awhile. If it's something that calved at home, the producer will have to make that call. There are some dangers in giving excess calcium, it can mess up the electrolyte balance, or in extreme situations actually stop the heart. We recommend you work with your vet on a case-by-case basis. What do you recommend if a cow prolapses before calving, and she's not ready to calve? Dr. Schieber: A vaginal prolapse is the kind that comes out before cows calve. It's genetic, and those cows will prolapse again the next year like clockwork. If you want to sew up a prolapse yourself, I don't necessarily think it's something that ranchers can't do. If you're capable of it, I'm okay with that. I do see a few cows every year where someone has fixed the prolapse and it comes back out. But then again, I've also had some prolapses that I'VE fixed come back out. If a cow has had a prolapse sewn up before calving, is there a way she can still calve without assistance? Dr. Schieber: There's not necessarily any way you can sew a prolapse up that is going to guarantee she is going to have the calf without taking the sutures out – there's just not a sure way to make that happen. There's many different ways to sew a prolapse up – we use a purse string, which is basically a big loop sucked down around the opening. We tell everybody you should keep a close eye on the cow because you'll need to take the sutures out when she starts to calve. But, it can be difficult to tell if she's starting to calve. The thing to watch for is she will go through many of the same processes – go off by herself, stand with her tail up. Another concern to watch for is sometimes a prolapse will stand around and push all the time just because they're prolapsed. It's hard to tell if they're pushing because they're prolapsed or because they're trying to calve. Sometimes when a cow prolapses and we know she's close to her due date, we'll just go ahead and do a c-section to ensure that we get a live calf. Is there any special care that needs to be given to a cow after a c-section? Dr. Davison: It's important to make sure there's no incisional swelling, and that the cow is eating and drinking normally. If it's a normal, clean cesarean the antibiotics they receive at the time of surgery are sufficient. However, if they have had a dead calf inside for a while, particularly if it was starting to slip hair, there is generally a greater chance of contamination. In these cases antibiotic follow-up can be more of an issue. Can calf pullers be harmful? Dr. Schieber: I don't necessarily think calf pullers are a bad thing. Some people don't believe in them, they think they put too much pressure on the cow – which they can if not used properly. The thing to keep in mind is if you're pulling on a calf, as long as there's progress you can proceed. If you get to the point where nothing is happening, and you're just putting a tremendous amount of pressure on the cow, maybe you should stop and reconsider. What happens when a cow gets paralyzed after birth? Dr. Davison: Typically paralysis comes from trauma to the obturator nerve, which runs through the framing in the pelvis. It gets pinched by too big of a calf, or a calf in birth canal too long. Pressure on this nerve causes muscle weakness in the hind legs to where they can't get up. We can help some of those situations with anti-inflammatories, but some of it just takes a lot of time and a lot of TLC. The time frame can vary by the amount of nerve damage done. Sometimes they can be down 2-3 days, but I've seen some that were down most of the summer, and then one day were up grazing. Are there any recent technologies that have improved calving success? Dr. Davison: Things have changed a lot over the last 30 years, but mostly through EPDs and more predictability of calving ease. Today we can chose bulls with better calving ease predictability and we have generations of data to back that up. That has made a big difference, in this part of the country anyway. Consequently, we do maybe 1/5 of the number of cesareans that we used to 30 years ago. As far as new technologies, not really. People still have to get up and watch 'em. Some people have started using video cameras on their calving barn to keep an eye on them at night, but for the most part, heifer management practices haven't really changed a lot in the past 30 years.